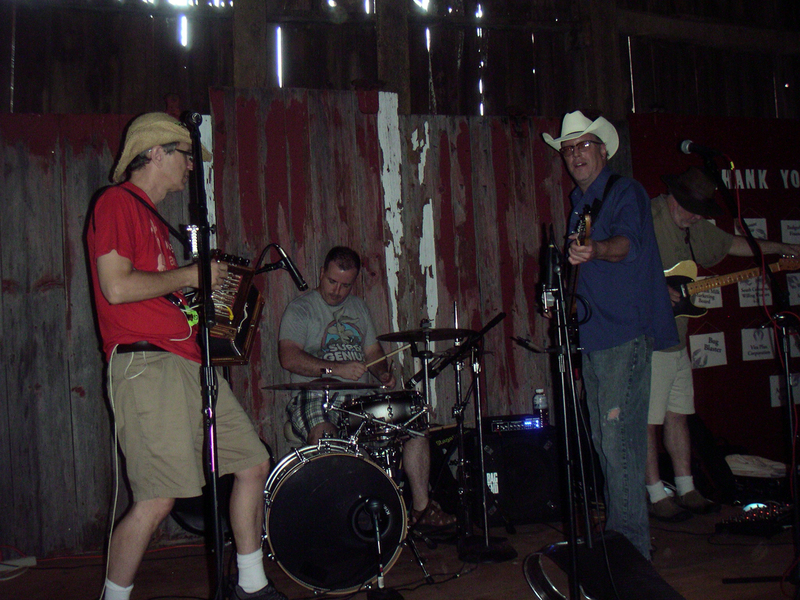 Yesterday we hosted the first annual Cajun in the Country Festival in our barn. And it was good. Or at least I hope so. I was a bit nervous about having an indeterminate amount of people converging on our property not quite knowing what to expect. 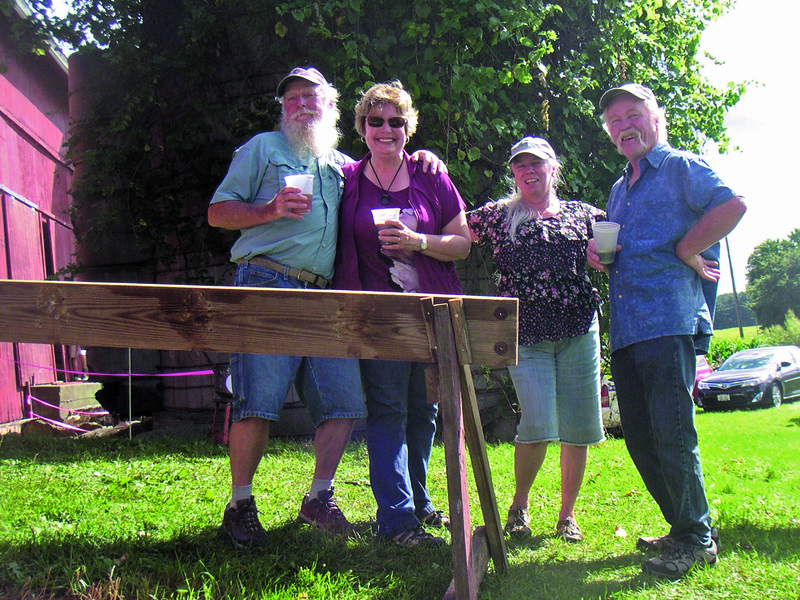 But let me tell you something, the Cajun music followers are wonderful. I loved it! They brought their lawn chairs and made themselves quite at home. Or quite at barn. Good thing because the day started off a bit rainy, but that didn’t stop the fest. 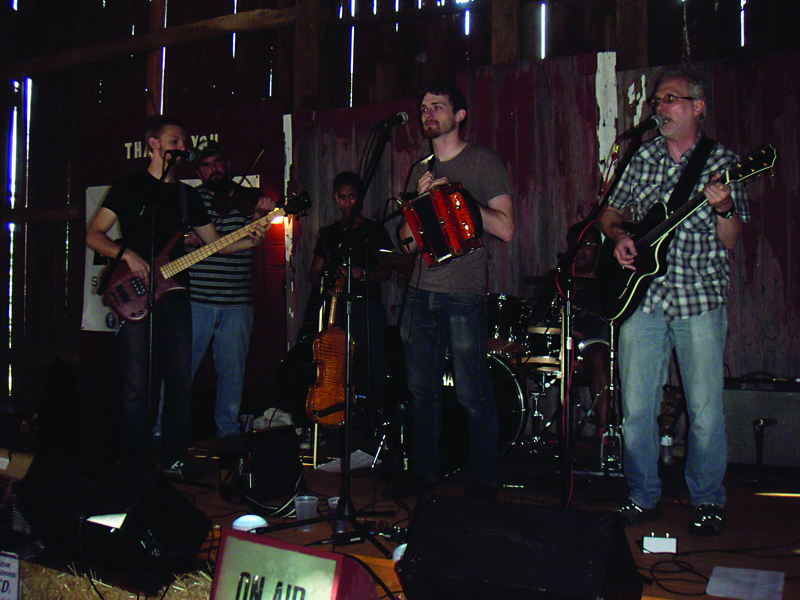 The barn kept everyone dry and the bands played on. 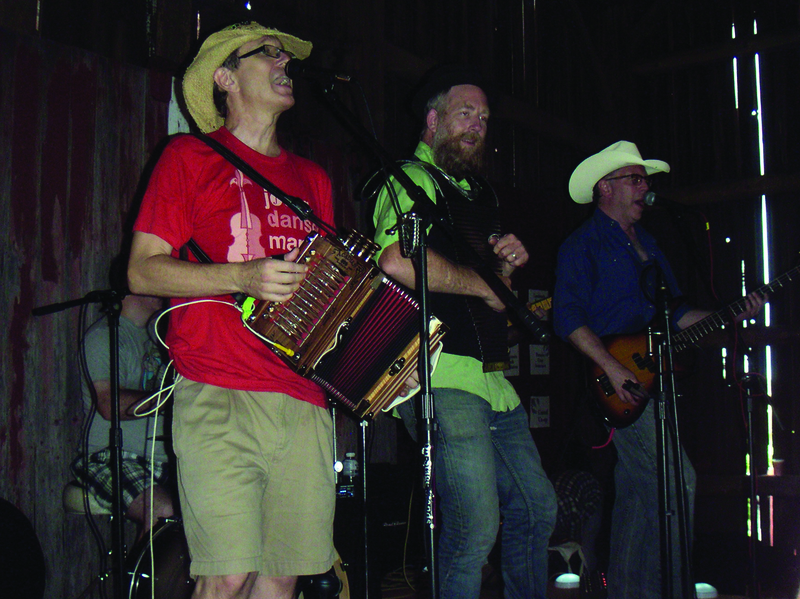 Speaking of bands, we had three great bands that played their hearts out; Cajun Strangers, Cajun Vagabonds and JJ’s Zydeco Paydirt. I was amazed at how some people can so fluidly dance to this music. If you’re anything like my husband and myself, best get a dance lesson from Karen who helped walk us through the moves. I think I need a little more practice on that front. 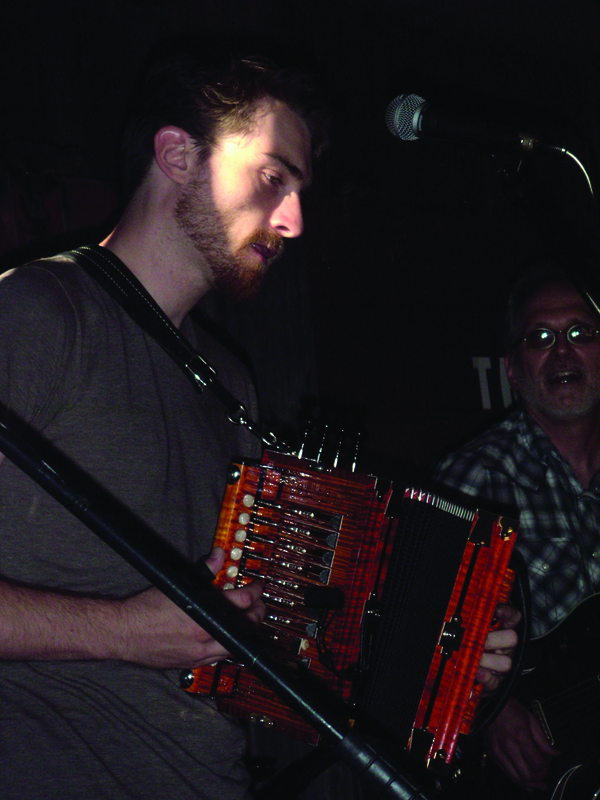 I’m not going to pretend that I know Cajun music all that well. I know that I like it, love it in fact. But I don’t know the intricacies as this gathering did. So I pretty much watched and listened in amazement. And I’ve never seen so many cowboy boots in this barn before. 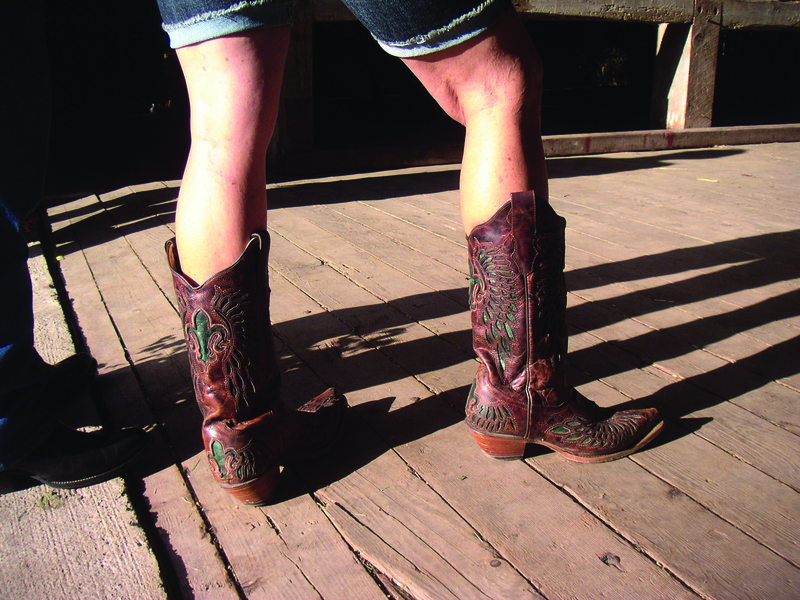 I think I got a little too entranced by cowboy boots. Stop the madness! Your boots are intoxicating! I’m trying to pay attention to the music but I see these great boots walking! And all of a sudden I’m crawling on my hands and knees begging to touch boots. Something’s wrong with me. But come on, can you blame me? Oh sigh, let’s move on before I hyperventilate. Let’s talk about the great people who showed up, every one of them. We’ve gone from bands to boots and now to the people. Everyone one was so amazing and courteous, as well as just plain fun. Thank you all for showing up. Bands, boots, people and oh yeah! Food! 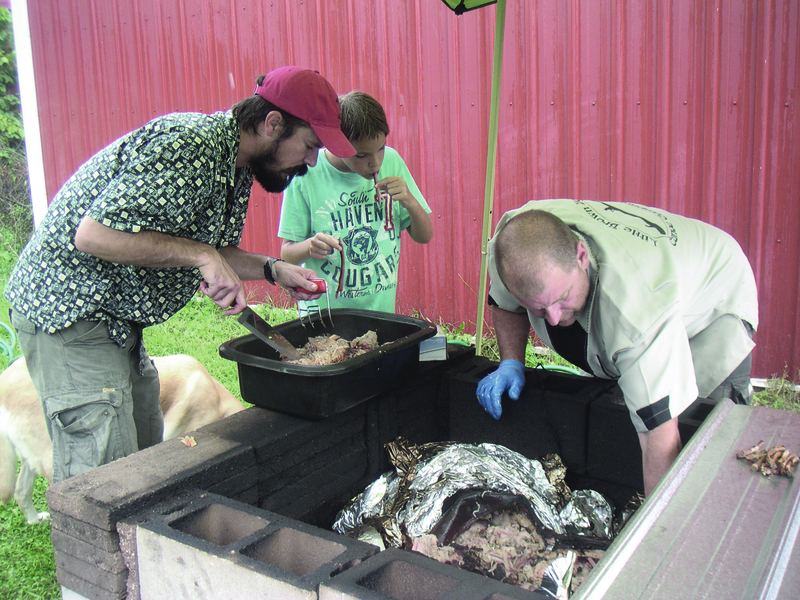 Good stuff…the pig was roasted right on the property, diligently tended to by Warren and his trusty dog Maddie. They both stayed by the pig overnight catching pig-naps in their tent. Or the truck. I’m not sure which because I was sleeping. In the house. This is the first time I ever saw the pig roast process from start to finish. And now that the pig camp is gone, I miss it. I miss Warren and Maddie and the whole set up. Come back. Next year. Tomorrow. Now. It wasn’t all about pig though…we had some good beer, wine and alligator jambalaya! What? Alligator in Wisconsin!? Who cares, I had to have some. And I did and it was good. Oh and there was an after-party at the Hydro where we then had a hefty plate of Crawfish & friends (potatoes, corn and bread). I think Wisconsin just shifted south a few latitudes. I don’t mind that. And thank YOU for making a blog appearance!! hee, snuck that one in behind your back, didn’t I?! Had a blast at this event!!! I hope it becomes an annual event..Great food, beverages, and dancing. Parking is the only minor complaint…Well worth the trip from Minnesota. Eric and Dancin’ Deb from St. Paul. I hope it becomes an annual event too. And the feedback I’m getting is good for us and the festival committee. We’ll be taking all that into consideration in how to make it even better. Thanks Eric! I recognize 2 of those 3 pair of boots….photo #7, the two tone pink ones belong to Karin from Madison, and the Brown and turquoise pair belong to the very color coordinated Sandra from Columbus…. ah-ha! 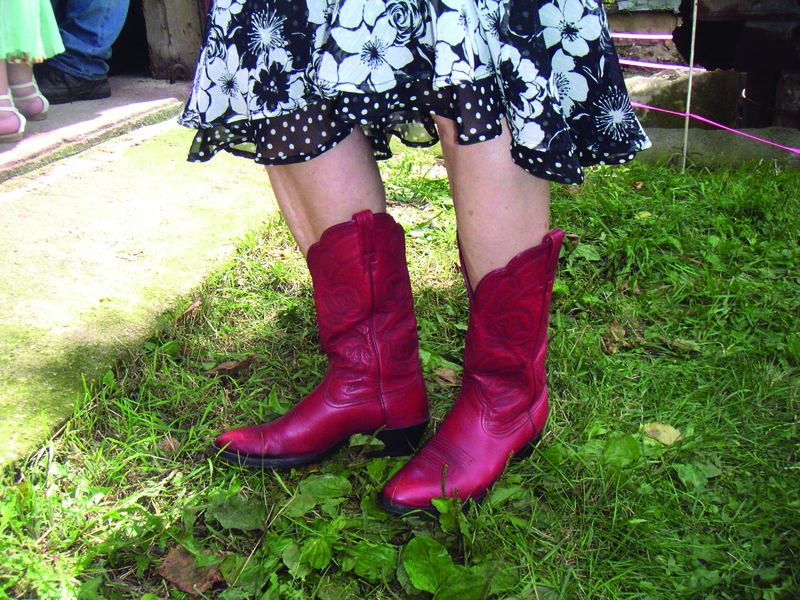 So that leaves the mysterious Ms. Red Boots, she was very kind to let me take a photo of her boots, as were the others! 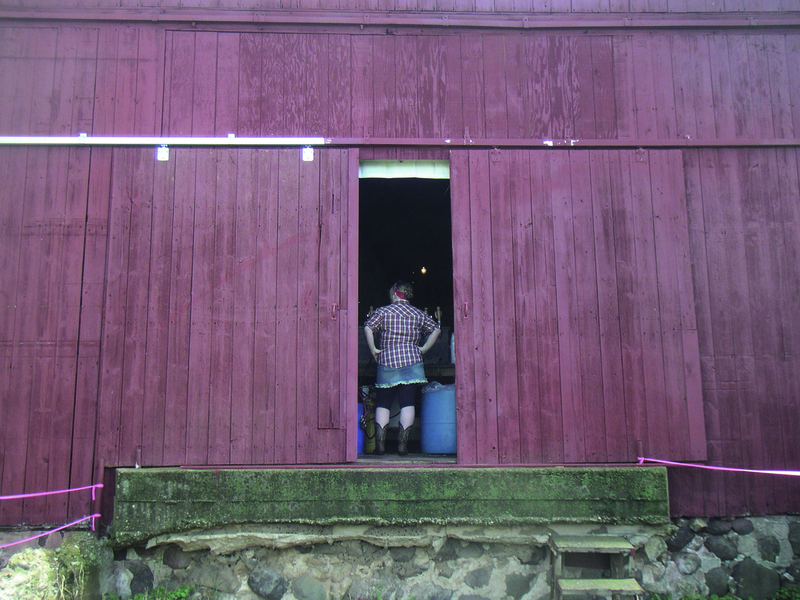 This wasn’t just any barn we danced in. 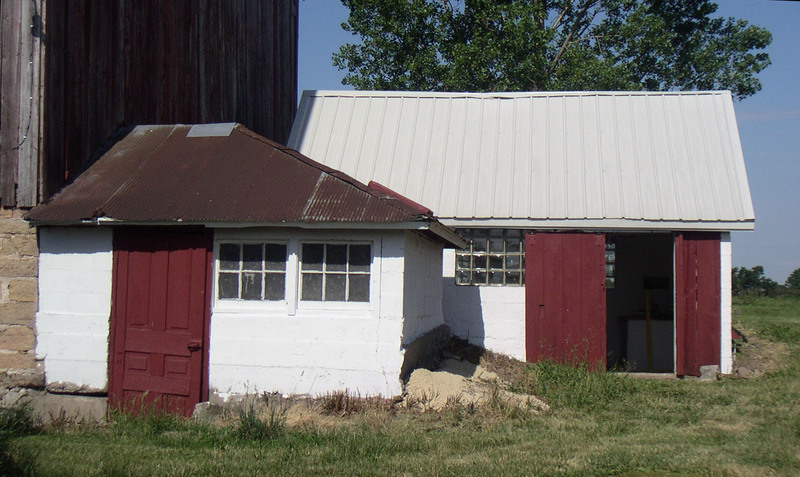 It was obviously a well cared for and well loved barn and farm. It truly captured the spirit and love of the country in which Cajun dancers and musicians could play and dance to the best music to be heard. Thank you! 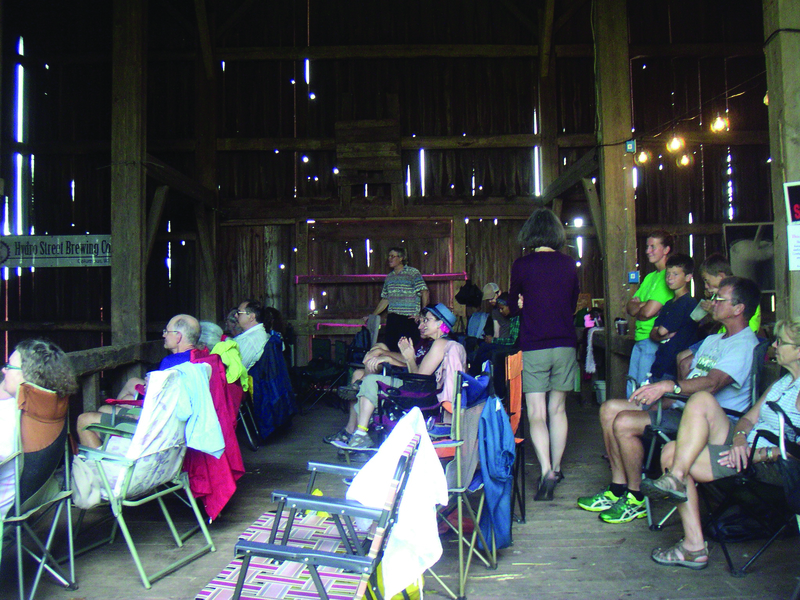 That is a big part of why we did this, to share this wonderful barn. We’re very glad you all enjoyed it and the festivities! 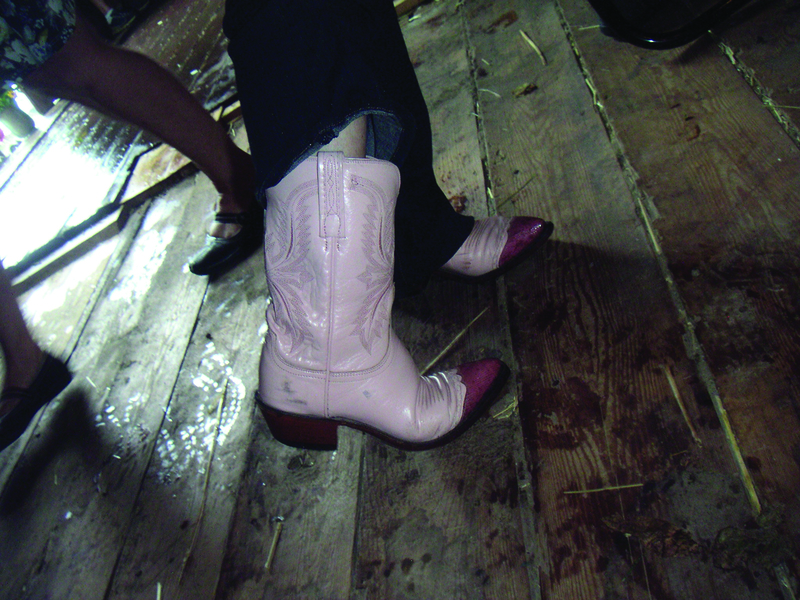 Thanks for hosting…loved the fest, loved the music, loved the dancing…AND the boots!